Krunal Pandya's had an excellent outing on debut and Kuldeep Yadav turned his way to glory once again as India won the first T20 encounter to take a 1-0 lead in the series. However, the result could have seen Windies as the winner had Carlos Brathwaite used his resources purposefully. 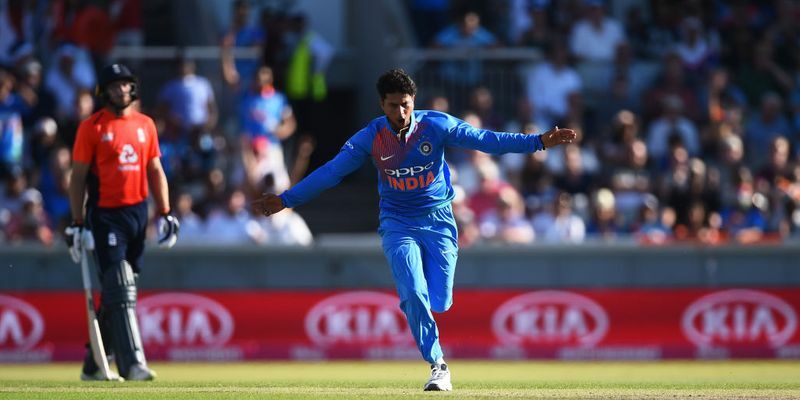 Flight, deception, slow pace and teasing lengths - these are what the stuff spinners use in the longest version of the game to set up a batsman, but Kuldeep can use it everywhere, irrespective of the colour of the ball. Remember Cardiff? Kuldeep left himself exposed by shortening his length, thus allowing more space and time for Alex Hales and Jonny Bairstow to pick him from the pitch, but he has rarely made that mistake since then. Today, he pitched it up continuously and Darren Bravo had stretched himself forward, but fell short and was beaten by the turn and bounce. Bravo went for the aggressive option straight away and tried hitting him over long-on, but ended up miscuing it. After that, he bowled a couple of googlies and mixed that up with a generous conventional leg-break to keep Rovman Powell interested. Kuldeep got enough overspin on the ball to land it fuller with the line drifting to get Powell driving as well and dismissed him easily. There is a perception floating around in the international cricket that if they do more and more video analysis of Kuldeep, they will start to read him better, which makes complete sense. But when an opponent starts to take a mental hold over batsmen, it can become difficult to express yourself fluently. His attacking mindset holds true for the proposition that he can literally make the opposition gasp for breath and that allowed Rohit Sharma to use him as a gun bowler to break Windies’ back from the outset. Windies have a great history of producing aggressive fast bowlers who used to charge in and attack batsmen with the short ball before setting them up with a full one on the stumps. There is an obsession with what speed each bowler can reach, and those who can bowl at over 140kmph, have got a sort of respect and, more importantly, fear. And that is exactly why Oshane Thomas is such an exciting talent. He bowls continuously at 145 kmph and gets the ball to bounce off the surface. He even bowled few balls around 148 kmph which was seriously impressive for any bowler in the T20 format. When he made his ODI debut against India in Guwahati last month, he clocked 147kph, 147kph, 140kph, 149kph, 147kph, and 147kph in his first over. While pace is his major weapon, he regularly erred with his lines and lengths to make batsmen uncomfortable. Today, when he dismissed Rohit Sharma by beating him with his pace, his previous four balls slided past him and none was lesser than 147. This is what pace can do to a bowler’s fortune. However, as far as his own career is concerned, there is a downside to it. He seems to lack the fitness to compete for more than one spell, which anyone will accept is a very dangerous trait to have. This will make him a very one-dimensional bowler and the chance of picking up injuries will increase too. Unless he brings a change to his fitness regime and Shoaib Akhtar-like transformation, another fine talent will go down the drain. There is a sense of mysteriousness around this Windies team as the team handed as many as three players debut cap. One among them was Khary Pierre - a finger spinner with no variations. He is a throwback to the time when off-spinners used to keep a steady line and wait for the batsmen to commit mistakes. His tall stature with a repeatable high-arm action helps him land the ball accurately and imparts revs and dip and as an emblematic of his defensive abilities, he got 63% of his deliveries in T20 cricket in the Powerplay. The experiment worked successfully in the CPL as he bowled with an economy rate of just 6.51 runs per over with a strike rate of 18.0, which is the third lowest strike rate for any left arm spinners in the Powerplay in T20 cricket. Windies could have used him in the powerplay overs and keep the pacers, who was obviously gaining more purchase, for the death overs. However, they finished Oshane Thomas’ overs by 10th and didn’t give Pierre a single ball before that. This tactical blunder proved costly for the team as the spinner failed to make any sort of impact with the wet ball and let go of all the advantage created by the pacers in the beginning.